Back for its third year! 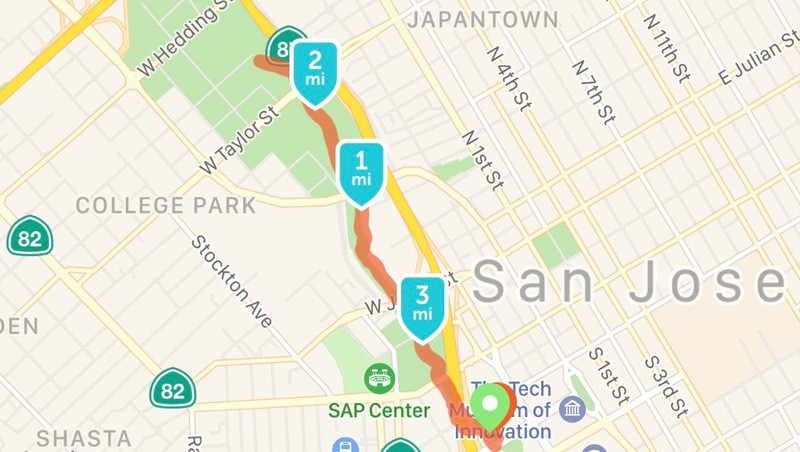 Kick off your mornings right with an easy 5k jog along the scenic Guadalupe River while chattting about all the fun stuff announced at WWDC. Anyone who owns a pair of running shoes is encouraged to join us. We'll be meeting at 7:20am Monday - Thursday to hit the trail promptly at 7:30am. If you snooze and get there after 7:30am I hope you can run fast enough to catch up 😉. Most people are done the run by 8am, leaving plenty of time to shower and clean up before the conference. We follow the Guadalupe River Trail north into Guadalupe River Park, where we U-turn and head back to complete a 5k. While I tend to keep about a 9:30/min pace in the middle of the group, we have people joining us at all speeds: plenty ahead of me at 8/min pace, and many behind uptwards of 13/min pace. I encourge anyone who can run a 5k to show up! We'll be meeting at the bridge outside of the Adobe building on Park Avenue: 345 Park Ave, San Jose, CA 95110. It is about a 10 minute walk from downtown. 👋 Hope you'll join us! The Dub Dub Run is organized by Curtis Herbert.